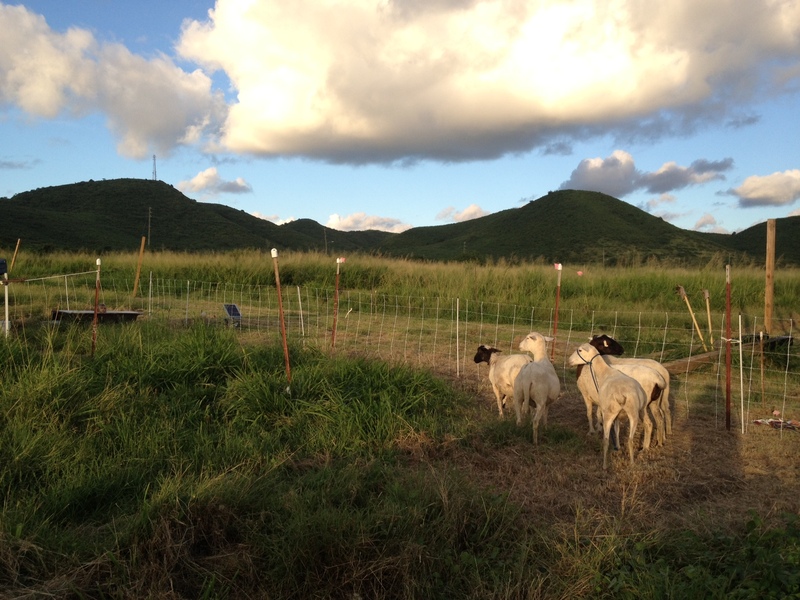 Our original five hair sheep pastured with electric netting at ARTfarm, 2011. ARTfarm’s livestock grass farming program is well established. We have approximately 35 acres of pasture that rotate in and out of cultivation, and have successfully applied holistic management practices in the tradition of Voisin and Allan Savory. This puts the focus on the health of the pasture as the primary concern of the farmer, with rapid rotation of ruminants through small paddocks encouraging even grazing of all plant species and vigorous regrowth of a biodiverse pasture. A beneficial side effect is that the rapid rotations greatly limit intestinal worm loads in the animals, as they are not exposed to manured areas of pasture for more than a week nor eating the grass lower than four inches, thus constantly staying ahead of the life cycle of the parasites. This management practice is designed to mimic the natural grazing behavior of wild herds of grazing animals in large open spaces, who are ‘fenced in’ by predator pressure, graze shoulder to shoulder and continually move to fresh pasture. This micropasturing “pulses” the vegetation, prevents compaction and erosion of the soil or exposed soil in watering areas, and encourages robust plant health and growth. We have built rudimentary handling facilities for working small stock. We subdivide pastures with electric fencing for grazing rotations. The size and duration of the rotation paddocks vary with the pasture conditions and the size of the livestock group. It was unusually rainy in 2010 and 2011, and 2012 was unusually dry. 2013 was wet. 2014-2015 was been primarily extreme drought with brushfires on the east end of the farm. 2016-2017 has been blessedly rainy throughout the fall, but the island was heavily affected by Hurricane Maria in fall 2017. In 2018 we experienced extreme drought and brushfires in the late spring/early summer. We started in late 2011 with a small commercial herd of local St. Croix White, Katahdin and Dorper hair (meat breed) sheep and, depending on rainfall, plan for one to three staggered lamb crops per year. We are selecting for parasite resistance, calm temperament and maternal efficiency (healthy moms who easily deliver multiple birth lambs that grow quickly). Eventually we’d like to develop a milkable Dexter/Senepol cross with some Jersey or Guernsey A2 genetics, and possibly add some goats in the rotation as well – we’d love to have a dairy nanny or two in the mix eventually. Our animals know us and are comfortable and friendly with us, but wary with strangers. We use livestock guardian dogs (LGDs) to help protect the livestock from feral/stray dogs. We use minimal pressure, low stress handling methods as prescribed by Bud Williams and Steve Cote. The only supplements our sheep receive are Himalayan sea salt and certified organic Fertrell mineral and kelp powder, free choice. We occasionally harvest fresh seaweed from local waters, which they enjoy the same day. In addition to the ruminants, we have two or three active chicken tractors with rotating electric fenced pasture, with a total of a dozen chickens (second and third generation mixes of heritage layer breeds like the Araucana, Black Langshan and Rhode Island Red). Our Pekin ducks have moved on to a peaceful retirement at Toni Lance’s bird rehabilitation center. We started five heirloom variety turkeys on pasture in summer 2013. Most of them were wiped out by a feral dog attack in 2014, soon after our LGD passed away suddenly. The remaining pair of turkeys bred successfully and raised a dozen young. We’ve now produced three generations from that survivor pair. All of the birds enjoy a steady diet of fresh pasture, a bit of layer mash, grubs and termites, windfall fruit, and regular seconds from our tomato and salad mix processing. At some point we’d like to expand the poultry projects; currently they feed our family with an occasional surplus for the farmstand. For all livestock, we intend for the animals to be sustainable within the farm and thrive on their naturally intended diet; to not depend wholly on (consume minimally) modern processed (imported) feedstuffs. This means we do not feed ANY commercial grains to ruminants, instead supplementing their diet as needed with additional forages from our farm. For treats and training, our sheep enjoy garlic chives and tantan, moringa, cowpea or manjack foliage instead of sweet feed. We are researching and experimenting with growing sufficient grain, high protein forage and/or mealworm forage to eliminate the purchase of commercial feed as a protein source for poultry. We started beekeeping in 2011, with the removal of a large colony that took up residence in the ARTbarn Gallery wall. We now have three active hives of reclaimed local swarm bees and hope to expand to at least five more. Local bees are usually partially Africanized hybrids, and while they are more defensive than pure European bees, we find our ladies to be pretty mild mannered when worked respectfully. Beekeeping chores are light at this point, with a hive inspection every season or more often if warranted. We are fans of Michael Bush and use very low-key, natural (no chemical treatment, conservative production) beekeeping techniques. Our management practices for all our livestock follow or exceed all USDA NOP (National Organic Program) and AWA (Animal Welfare Approved) standards for livestock production (due to time and cost constraints, we are not currently certified, but we welcome customers to ask questions about how we meet these standards and visit our farm by appointment).